Cadbury Bournville is repositioning as ‘Not so sweet’ and how! The fine dark chocolate that until a few months ago emphasized on one having to ‘earn a Bournville’ rather than buy it, ever since its launch in India, is now taking a step back and letting us fall for the 44% cocoa with the ‘not so sweet’ differentiation. The repositioning started with a new television commercial launched by the dark chocolate brand a few months ago, where viewers were made aware of how too much sweetness can be dangerous, while highlighting the ‘not so sweet’ side of a Fine Dark Cadbury Bournville. A group of girls are gathered around a table and one of them gets gobbled up by a carnivorous plant growing nearby, as if to punish her for spreading ‘too sweet’ stories about a kitten gifted by her dad. While the TVC uploaded on the 14th of May has garnered more than 5 million views, there have been some cool campaigns taking the ‘Not so sweet’ message forward on social media. Ever since the ad has been out, the Facebook page of Cadbury Bournville – which is 3.7 million fans strong – has been stressing on the ‘not so sweet’ side of a Bournville, by making ‘dark’ appealing and ‘sweet’ harmful. Since then the wall has come with a rather fascinating fan engagement campaign to be executed on Twitter. The Twitter campaign is called ‘Tape a Tweet’ – where users can share the obnoxiously sweet things around them with the brand. These would then be converted into a video by some of India’s leading stand-up comics, all within an hour. All one had to do was to tweet to the Twitter handle using the hashtag #NotSoSweet, and pray to Lady Luck to see it come alive. The wall has been sharing these videos and some brilliant visuals celebrating the dark. The complete YouTube playlist can be watched here. Additionally, the brand’s Twitter page has been creating conversations with the hashtag #NotSoSweet. The 2.5K follower base has been kept updated and engaged about ‘Tape a tweet’ and other content around the hashtag. Apparently, Cadbury as a brand is embarking on a completely new strategy on social media platforms for all of its sub brands – a social media strategy that goes beyond number of fans, retweets and impressions, to build an engaged online community for the longer run. Apart from the brand pumping in bigger budgets into social media marketing, it has also ensured to keep the fun alive and kicking! During the IPL 6, Cadbury Dairy Milk had launched the #ShubhAarambh League, with the objective of making a ‘Shubh Aarambh‘ or an auspicious start with a Cadbury during the matches. The brand created cool visuals as a part of its one-word descriptions for match moments, that were sourced from fans. Recently, Oreo – the world’s favourite cookie from Cadbury – had launched #Dunkathon, a cool fan-sourced initiative, where fans were asked to share their memorable moments. These would then be converted into personalised Oreo dunks and shared on social media platforms on the same day. On the occasion of RakshaBandhan, Cadbury Celebrations created #SongsForSisters, where the brand had asked brothers to share messages for their sisters on the brand’s social media platforms, and see them turn into song dedicated to the sisters by some of India’s leading bands. The future is social. For brands, the future in an evolving medium is to reap that social capital, by co-creating with the community and bonding better with customized content. 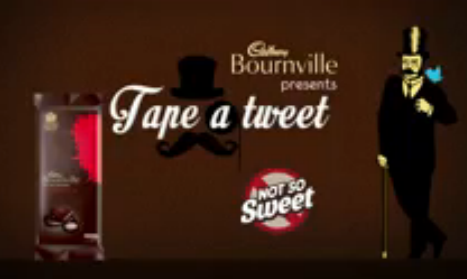 Cadbury Bournville’s ‘Not so sweet’ nails it with Tape a tweet. What do you think?